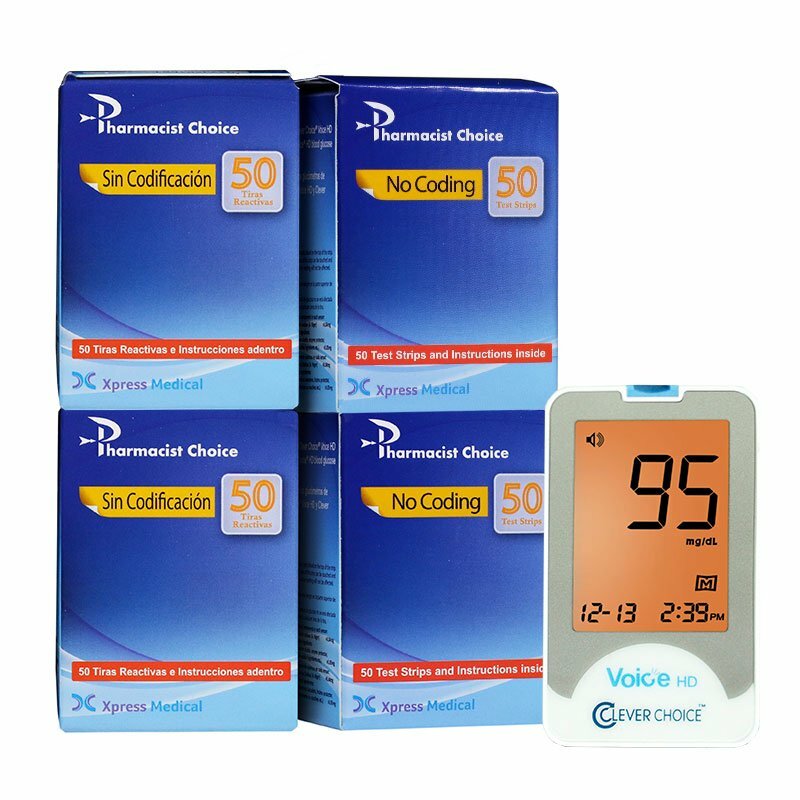 The Clever Choice Voice HD Talking Blood Glucose Monitor is a bilingual talking blood glucose monitor from Simple Diagnostics. The device provides additional benefits and features for patients, based on feedback we have received from both physicians and patients currently using a Simple Diagnostics blood glucose meter. The Pharmacist Choice glucose test strips require a small blood sample of 0.7 uL, offer alternate site testing and require no coding to work with the meter. Box of 200 test strips included. REF# CLEMVHD. The Clever Choice Voice HD Blood Glucose Monitor is excellent for the diabetic patient. The Clever Choice Voice HD requires No Coding, which means fewer steps and avoids the danger of false results caused by coding errors.It leads the user through the setup steps, testing and memory recall. The Clever Choice Voice HD is easy to use while providing safe, accurate test results every time. Has advanced (English/ Spanish ) talking function embedded that guides users through each step with repeat function and volume control. The Pharmacist Choice (formally Clever Choice) glucose test strips feature alternate site testing and only 7 ul of blood is required for testing. Contains 1 Meter and 200ct Pharmacist Choice Test Strips. Dimension (inch) 3.54" x 2.1655" x 0.59"